Hello Friends! We have had a tumultuous week here in the States and I think I am having an electoral "hangover"! In any case, we had quite a rally the last few days and fortunately our stocks participated! In fact, I was able to sell a portion of one of my stocks (AMHC) at a gain, which gave me a "buy signal" in my trading system, and added a position (CDIS) to my "Trading Portfolio". Again, thanks for visiting my blog, Stock Picks Bob's Advice, but I always like to remind all of you that I am an amateur investor, so please consult with your professional investment advisors before making any investment decisions based on information here, to make sure that your decisions are appropriate, timely, and likely to be profitable for you! I like to use the weekend, when I can find the time (!) to write up a short review of stock picks from the previous year. I do this a week at a time on a sort of rolling basis, currently I am up to the week of September 22, 2003. The first pick that week was TBC Corp (TBCC) which was posted on Stock Picks on September 22, 2003, at a price of $24.13. TBCC, and I had to check this a couple of times (LOL), closed on 11/5/04 at $24.13, for a 0% change (!). I think THAT is a first on this blog, closing a year or so later at the exact price (!). On 10/25/04, TBCC reported 3rd quarter 2004 results. Net sales climbed 31.5% to $476.5 million over the prior year. Due to hurricane effects (? ), same store sales decreased 1.7% during the quarter. Net income was up 9.0% to $10.9 million, or $.47/share, compared with $10.0 million or $.44/share the prior year. Overall, not a terrible report! On September 22, 2003, I posted Bio-Reference Labs (BRLI) on Stock Picks at $11.63. BRLI closed at $14.20 on 11/5/04 for a gain of $2.57 or 22.1% over the past year. On September 9, 2004, BRLI announced 3rd quarter 2004 results. Revenues came in at $35.8 million, a 24% increase over prior year revenues. Net income was $2.3 million or $.18/share, unchanged from the prior year. This was an o.k. result as I would much prefer to see strong earnings going along with the strong revenue growth! On 9/24/03, I picked Multimedia Games (MGAM) for this blog at a price of $34.30. MGAM split 2:1 on 3/1/04, and thus our effective selection price was $17.15. MGAM closed on 11/5/04 at a price of $13.87 for a loss of $(3.28) or (19.1)%. On October 14, 2004, MGAM announced warnings about the 4th quarter and 2004 results. They loweed guidance for the fourth-quarter and fiscal-year earnings due to "...lower-than-projected contributions from the sale of player terminals." This was NOT good news and the stock price responded accordingly. America's Car-Mart (CRMT) was selected for Stock Picks on 9/24/03 at a price of $29.61. CRMT closed at $34.81 on 11/5/04 for a gain of $5.20 or 17.6%. On 9/9/04, this Bentonville, Arkansas-based company (same as Wal-Mart...a coincidence? ), announced 1st quarter results. For the quarter ended July 31, 2004, revenues increased 17% to $50.8 million over the $43.3 million the prior year. Income increased 13% to $4.9 million or $.62/share vs. $4.4 million or $.55/share the prior year same quarter. The company also raised 2005 guidance, a bullish development! On September 25, 2003, I Posted Cree, Inc. (CREE) on Stock Picks at a price of $22.16. CREE closed at $35.28 on 11/5/04 for a gain of $13.12 or 59.2%. On October 14, 2004, CREE reported 1st quarter 2005 results. Revenue for the three months ended 9/26/04, came in at $95.9 million a 45% increase over the prior year's $66.2 million. Net income came in at $24.4 million or $.32/share compared with $8.9 million or $.12/share the prior year. This was a GREAT result, and the stock price responded accordingly! On 9/25/03, I posted WD-40 (WDFC) on Stock Picks at a price of $31.20. WDFC closed at $28.64 on 11/5/04 for a loss of $(2.56) or (8.2)%. On 10/27/04, WDFC announced 4th quarter 2004 results. Revenue for the period ended August 31, 2004, dropped 2.3% to $71.7 milion from $73.4 million. Quarterly earnings fell to $8.9 million or $.53/share from $10.3 million or $.61/share the prior year. Even though analysts (First Call) were looking for a decrease to $.55/share, WDFC underperformed even THAT weaker estimate. This is not my kind of earnings report! On September 26, 2003, I posted Research in Motion (RIMM) on stock picks at a price of $38.24. On June 7, 2004, RIMM had a 2:1 split making my effective pick price $19.12. RIMM closed at $77.75 on 11/5/04, for a gain of $58.63 (!!! ), or 306.6%. (Too bad I didn't buy any shares). On September 30, 2004, RIMM announced 2nd quarter 2005 results. Revenue came in at $310.2 million, up 147% from $125.7 million the prior year and up 15% sequentially from the prior quarter. Net income came in strong at $70.6 million or $.36/share, up sequentially and up from $2.1 million or $.01/share the prior year! This was a great quarter. And on September 26, 2003, I posted Abaxis (ABAX) on Stock Picks at a price of $13.40. ABAX closed at $12.40 on 11/5/04 for a loss of $(1.00) or (7.5)% since posting. On October 18, 2004, ABAX announced 2nd quarter 2005 results. Quarterly revenue came in at $13.6 million, up 18% over the prior year. Earnings per share came in at $.06, up 20% from $.05/share the prior year. These were good results (imho), and the stock has held its price fairly well. On September 26, 2003, I posted Cherokee (CHKE) on Stock Picks at a price of $20.90. CHKE closed at $29.00 on 11/5/04 for a gain of $8.10 or 38.8%. On 9/8/04, CHKE announced 2nd quarter earnings results. Revenue was up 3% to $10.2 million, from $9.9 million last year. Net income was up 16% to $4.3 million or $.50/share compared with $3.7 million or $.43/share the prior year. Nice results but not spectacular imho. What the street also liked was that Cherokee, on 10/21/04, announced an increase in the dividend, a 19% increase to $.50/share. Who says dividends don't matter? So how did we do for these nine stocks since they were "picked" during the week of September 22, 2003. Needless to say, the one SPECTACULAR pick of RIMM will pull up the averages! Including RIMM, the nine stocks had an average gain of 45.5% over the past year! Of course, this shows how one spectacular or miserably performing stock can sway the averages! Also, this assumes a "buy and hold" approach for investing, and I personally use an 8% stop loss approach, and sell portions of my stocks at gain targets. But this is probably informative to look back and see what would have happened if we HAD just bought and held on! Thanks again for stopping by! Please always do your own investigatin of all stocks discussed as I am an amateur investor. If you have any questions, comments, or words of encouragement, please feel free to email me at bobsadviceforstocks@lycos.com! Have a great weekend! Hello Friends! TGIF. We have had a wonderful week in the market with a very bullish performance for most of the indices. Today, strong October jobs numbers were reported and this appeared to strengthen the market further. Please remember, as you read my blog, Stock Picks Bob's Advice, that I am an amateur investor. Please consult with your professional investment advisors prior to making any decisions to make sure that such decisions are appropriate, timely, and likely to be profitable for you! If you have any questions, comments, or words of encouragement, please feel free to email me at bobsadviceforstocks@lycos.com . Looking through the list of top % gainers on the NASDAQ, I came across Valueclick Inc (VCLK) which closed at $10.91, up $1.34 or 14.00% on the day. I do not own any shares of this stock nor do I own any options in any accounts that I am responsible for. (I have a couple of managed accounts where shares may be purchased or sold that I may not be aware of!). According to the CNNMoney "snapshot", VCLK's principal activities "...are to provide products and services that enable marketers to advertise and sell their products." 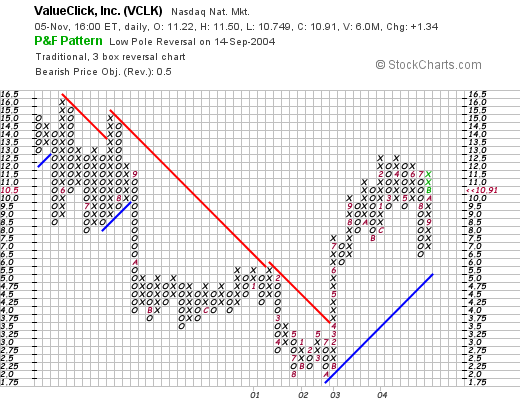 Yesterday, after the market close, VCLK reported 3rd quarter 2004 results. For the quarter ended September 30, 2004, VCLK reported revenue of $43.5 million, ahead of guidance of $37-$39 million and 92% ahead of the $22.7 million reported in the third quarter of 2003. GAAP (generally accepted accounting practices) net income for the third quarter was $7.6 million or $.09/share, ahead of guidance of $.06/share, and up from the $3.6 million in the third quarter 2003. VCLK also did something I really LOVE in a report, they RAISED GUIDANCE. For the fiscal year 2004, VCLK raised guidance in revenue from $154 million to $162 million. This was a nice report imho. How about longer-term? Taking a look at the "5-Yr Restated" financials from Morningstar.com, we can see that revenue has grown steadily (except for a dip between 2000 and 2001) from $26 million in 1999, to $124.3 million in the trailing twelve months. (See above, 2004 revenue should be coming in at $154-$162 million). Earnings, which were at $(.20)/share in 2001, have improved gradually, turning profitable in 2003 at $.13/share and improving to $.33/share in the trailing twelve months. Free cash flow has also been improving steadily from $(4) million in 2001, $(1) million in 2002, $12 million in 2003 and $22 million in the trailing twelve months (TTM). Looking at the balance sheet as reported on Morningstar.com, we find that VCLK has $239.3 million in cash alone, easily covering both the $31.9 million in current liabilities and the $4.1 million in long-term liabilities over 6 times over! In addition, VCLK has another $23.7 million in other current assets. What about valuation? Taking a look at the Yahoo "Key Statistics", we see that this is a "small cap" stock with a market cap of $873.67 million. The trailing p/e is 28.49, forward p/e is 29.49 (fye 31-Dec-05), and the PEG is at 1.77. Yahoo reports 80.08 million shares outstanding with 73.40 million of them that float. Of these there are 2.77 million shares out short representing 3.77% of the float or 2.68 trading days of volume. we can see that this stock has traded lower since May, 2000, from $16.00/share to a low of about $2.25/share in August, 2001. Since then, the stock broke through a resistance line in April, 2003, at $4.00/share and has traded steadily higher. The graph looks nice to me! So what do I think? Summarizing some of the things I noted, the stock made a nice move today on a gorgeous earnings report (imho). The company has a record of growing its revenue and improving its earnings for the past five years. They are cash-flow positive and have a beautiful balance sheet with loads of free cash. Valuation is reasonable, imho, although the PEG is a bit high, I suspect this will drop as the current numbers get integrated into the Morningstar site. The graph is nice as well! In fact, this is a pretty picture! Now, if I just had SOLD some of my stock at a profit so I could add a position! Thanks again for stopping by! Please remember that if you have any questions or comments, please feel free to email me at bobsadviceforstocks@lycos.com . Hello Friends! I just sold my remaining 225 shares of KNSY as it passed my target of a 30% gain on the downside from its last sale point at 60%. I hope you follow. The stock was purchased at approximately $22 in December 2003. I have sold this twice previously now, selling 1/4 of the original 400 shares, first 100 shares at around a 22% gain in January, 2004, and then a second 1/4 (75 shares) at a 59% gain in June, 2004. Now with the stock retracing below the 30% gain mark, my system says sell, and sell I did! Hello Friends! Thanks so much for stopping by. In spite of my less than perfect satisfaction with the election results, it was nice today to have a post-election rally. In fact, I was able to sell my first 1/4 position in AMHC at a very nice gain, and to go ahead and ADD a position, picking Cal Dive (CDIS) which showed up today! Thus, As always, please remember that I am an amateur investor so please consult with your professional investment advisors prior to making any decisions to make sure all investments are timely, appropriate for your needs, and likely to be profitable for you. If you have any questions, comments, or words of encouragement, please feel free to email me at bobsadviceforstocks@lycos.com . Looking through the list of top % gainers on the NASDAQ today, I came across Cal Dive International (CDIS) which closed at $38.25, up $4.24 on the day or 12.47%. Having just sold a portion of my AMHC today at a gain, I went ahead and picked up 200 shares of CDIS today, so I AM a holder of this stock. According to the CNNMoney "snapshot", Cal Dive's principal activity "...is to provide services to offshore oil and gas exploration and pipeline companies." This is earnings season and what drove the stock higher was a 3rd quarter earnings report. For the quarter, revenue jumped 27% to $131.9 million from $103.9 million last year. Earnings for the quarter rose to $22.8 million or $.59/share, up from $8.9 million or $.24/share last year. They came in $.10 ahead of estimates of $.49/share; however, revenue came in a little light as the street was expecting revenue fo $133.6 million. 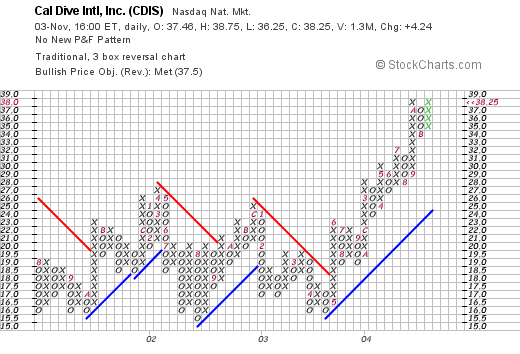 In addition, CDIS raised estimates for 2004 to $1.90 to $2.00/share from an earlier forecast of $1.30 to $1.70/share. This was exactly the kind of earnings I like to see, an announcement coupled with more aggressive expectations of revenue and earnings. How about longer-term? Taking a look at Morningstar.com "5-Yr Restated" financials, we can see that revenue has grown steadily from $161.0 million in 1999 to $453.9 million in the trailing twelve months (TTM). Earnings have been steady except for a dip in 2002, and have increased from that point in time starting at $.55/share in 1999, to $1.31 in the TTM. Free cash flow, which was a negative $(54) million and $(91) million in 2002, improved to $5 million in 2003 and $110 million in the trailing twelve months. How about valuation questions? Looking at "Key Statistics" from Yahoo, we can see that this is a mid-cap stock with a market cap of $1.46 billion. The trailing p/e is a big rich at 29.88, however the forward P/E (fye 31-Dec-05) is more reasonable at 17.79. The PEG, with the fast growth rate, came in at .77. Yahoo shows 38.28 million shares outstanding with 35.70 million that float. There are 1.01 million shares out short as of 10/8/04, representing 1.867 trading days of volume. Not very significant imho. No cash nor any stock dividends are reported by Yahoo.com. Here we can see that this stock was actually going nowhere betwen 2001 and 2003, until in May, 2003, when the stock broke through a resistance level of about $17.50, and has traded higher since. The stock may be a wee bit ahead of itself, but overall the graph looks nice to me. So what do I think? The stock had a great day today on a great earnings report which included dynamic revenue and earnings growth as well as management plans to raise their own estimates. Valuation is nice, even though the P/E is about 29, the PEG is under 1.0. In fact, I liked this stock so much that I bought it. Thanks so much for stopping by! Please feel free to email me at bobsadviceforstocks@lycos.com if you have any questions, comments, or words of encouragement. Hello Friends! If you know anything about ME, lol, you will know that when I have a nickel in my pocket, I got to spend it. Reminds me of that old Cracker-Jack commercial...."What do you want....". I came across Cal-Dive (CDIS) earlier today and it seems to fulfill our criteria. I will post a full note on this one in a bit...but went ahead and purchased 200 shares of CDIS in my Trading account at $38.158 for a cost of $7,631.60. As always remember that I am an amateur investor, so please consult with your investment advisors before making any investment decisions based on information on this website. If you have any questions or comments, please feel free to email me at bobsadviceforstocks@lycos.com . The market certainly does NOT like uncertainty. With John Kerry's gracious concession to President Bush this morning, the market has rallied and responded to the certainty of economic policies the next four years. The "good news" about all of this is that my portfolio has just moved a position to a "sell point" and I sold 75 shares of my Amercan Healthways (AMHC) at $32.76 for net of $2,448.94. This represents 1/4 of my position of 300 shares (leaving 225 shares left) in my "current trading portfolio". These shares were purchased at $23.53/share on 6/18/04 for a gain of $9.23/share or 39.2%. As you will recall, I use a price target of about 33% for my first sale of a stock and also use the sale of a stock at a gain as a market signal allowing me once again to buy another position...so I am on the lookout and will keep you posted. Please always remember that I am an amateur investor, so please do your own thorough investigation on all stocks discussed on this website and consult with your professional investment advisors to make sure all of your stock investment decisions are appropriate, timely, and likely to be profitable for you. If you have any questions, comments, or words of encouragement, please feel free to email me at bobsadviceforstocks@lycos.com . Hello Friends! I just wanted to wish all of you a safe and happy Halloween! Next week shall be quite exciting, as we are not sure who will be trick or treating at the White House, and who will be handing out candy next year! "Looking Back One Year" A review of stock picks from the week of September 15, 2003. Hello Friends! Thanks so much for stopping by. With the election coming up quickly for all of us, it is nice for me to look at the investment world and focus away from politics for a moment! As always, please remember that I am an amateur investor, so please do your own investigation into all stocks discussed on this website and consult with your professional investment advisors on all investments to make sure they are appropriate, timely, and likely to be profitable for you! Please feel free to email me if you have any comments, questions, or words of encouragement at bobsadviceforstocks@lycos.com . On September 15, 2003, I posted Aeropostale (ARO) on my blog at $27.25/share. ARO split 3:2 on April 27, 2004, making my effective 'pick' price of $18.17. ARO closed at $31.55 on 10/29/04 for a gain of $13.38 or 73.6%. ARO reported 2nd quarter 2004 results on August 19, 2004. Net sales for the quarter increased an impressive 50% to $194.9 million vs. $129.9 million in the prior year same period. Even more impressive was the 20% same store sales gain in the quarter! Net income came in at $10.9 million for the quarter ended July 31, 2004, or $.19/diluted share compared to net income of $2.7 million or $.05/diluted share last year. These were GREAT results imho. On September 16, 2003, I posted Frisch's Restaurants (FRS) on Stock Picks Bob's Advice at a price of $23.75/share. FRS closed at $23.00/share on 10/29/04 for a loss of $(.75)/share or (3.2)%. On October 18, 2004, FRS reported 1st quarter 2005 results. Revenues rose 9.1% to $84.5 million from $77.4 million last year. Net earnings, however, declined 11.8% to $2.9 million compared to $3.3 million in the prior year. Diluted earnings per share decreased to $.56/share this year, compared with $.65/share last year. Same store sales of the Big Boy Restaurants increased an anemic 0.6% during the quarter. These results were less than inspiring imho. I posted Lexar Media (LEXR) on this blog on 9/16/03 at a price of $19.73/share. LEXR closed at $6.76 on 10/29/04 for a loss of $(12.97)/share or (65.7)%. 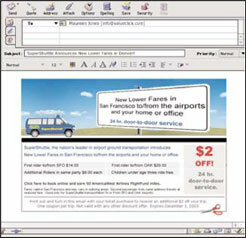 On October 14, 2004, LEXR reported 3rd quarter 2004 results. Revenue rose nicely to $165.2 million from $98.7 million during the same period the prior year. However, with operating costs growing, the company reported a net loss of $(3.5) million or $(.04)/diluted share compared with a net income of $9.7 million or $.12/share the prior year. These results are also somewhat less than stellar! TALX (TALX) was posted on Stock Picks on 9/17/03 at a price of $26.25/share. TALX closed at $28.35 on 10/29/04 for a gain of $2.10/share or 8%. 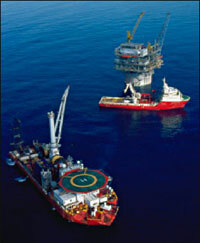 TALX reported 2nd quarter 2004 results on October 27, 2004. Revenues for the quarter ended September 30, 2004, increased 16% to $36.6 million from $31.5 million last year. Earnings came in at $4.05 million in 2004, vs $3.29 million last year. On a per share fully diluted basis this came in at $.30/share vs $.24/share the prior year. These results are adequate to keep our interest! I posted Endo Pharmaceuticals (ENDP) on this blog on 9/17/03 at a price of $21.19. ENDP closed at $21.80 on 10/29/04 for a gain of $.61 or 2.9%. On October 14, 2004, ENDP announced 3rd quarter 2004 results. These were ahead of expectations. Revenue for the quarter ended September 30, 2004, came in at $160.3 million compared with revenue last year of $149.4 million. Earnings came in at $41.4 million or $.31/share, compared with earnings of $39.9 million or $.30/share the prior year. Although not spectacular, the stock still moved ahead as the results were ahead of "expectations". I posted Gen-Probe (GPRO) on Stock Picks on 9/17/03 at a price of $62.90. GPRO split 2:1 on 10/1/03, thus reducing our effective pick price to $31.45. GPRO closed at $35.04 on 10/29/04 for a gain of $3.59 or 11.4%. On August 5, 2004, GPRO reported 2nd quarter 2004 results. Total revenues for the quarter came in at $61.2 million compared to $50.7 million the prior year. Net income came in at $31.5 million or $.62/share compared with net income of $16.8 million or $.35/share the prior year. The company ALSO raised fiscal 2004 guidance. A great earnings report WITH raised guidance is all an investor could ask for! Third quarter earnings should be released on November 4, 2004, so watch those results closely! On September 18, 2003, I posted Merge Technologies (MRGE) at $18.99. 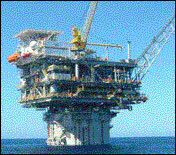 MRGE closed at $17.965 on 10/29/04 for a loss of $(1.025) or (5.4)%. On October 27, 2004, MRGE announced 3rd quarter 2004 results. Net sales for the quarter came in at $9.3 million, a 22% increase over net sales of $7.6 million the prior year. Net income was $2.2 million of $.16/diluted share compared with $1.6 million or $.12/diluted share the prior year. These appeared to be solid results imho. IDX Systems (IDXC) was posted on Stock Picks on 9/19/03 at a price of $26.20. IDXC closed at $33.535 on 10/29/04 for a gain of $7.335 or 28.0%. On October 27, 2004, IDXC reported 3rd quarter 2004 results. Revenues for the quarter increased 34% to $136.1 million compared to $101.4 million for the same quarter in 2003. Net income came in at $9.8 million or $.31/diluted share, compared with $10.3 million, or $.34/diluted share last year. These results were o.k. for the street but not exactly exciting in my humble opinion. As you know, I always prefer to see growing revenue AND earnings. Regardless of the reasons. O.K. hang in there!....just 2 more to review. On September 19, 2003, I posted Navigant Consulting (NCI) on Stock Picks at a price of $14.53. NCI closed at $24.87 on 10/29/04 for a gain of $10.34 or 71.2%. On October 19, 2004, NCI announced 3rd quarter 2004 results. Revenues for the third quarter, 2004, were $126.3 million, a 55% increase compared with 3rd quarter, 2003, results of $81.4 million. Sequentially, this was also an increase from the $123.8 million in the prior quarter. Net income came in at $11.0 million or $.22/share compared with $10.5 million, or $.21/share the prior year. This was a satisfactory if not spectacular result! Finally, the last stock selected that week was Stratasys (SSYS) which was posted on 10/19/03 on Stock Picks at a price of $50.04. SSYS had a 3:2 stock split making our effective "pick price" at $33.36. SSYS closed at $29.28 on 10/29/04 for a loss of $(4.08) or (12.2)%. On 10/28/04, SSYS reported 3rd quarter 2004 results. Revenues climbed 37% to $17.7 million for the quarter ended September 30, 2004, compared with $12.9 million recorded the prior year. Net income was $2.5 million or $.24/diluted share compared with $2.0 million, or $.20/diluted share the prior year. Stratasys also went ahead and raised guidance for the full 2004 fiscal year. A great earnings report ALONG with increased guidance is almost ALWAYS a good portender of higher stock prices. In conclusion, during the week of September 15, 2003, I made ten stock picks with review now showing six with gains and four with losses for an average gain of 10.86%. Please remember that for this exercise, I assume a buy and hold practice, and if you read anything on this blog, I am sure that my actual results are quite different because I do not hang onto my losers after an 8% hit. A reader writes "I am thinking of starting a stock picking blog"
advice you have? I hope to hear from you, thanks! First of all, I am quite frankly a bit weak on the number of visitors! I don't ask people to sign in, and I get a rough idea from the few stats I do have. My main website, Bob's Advice for Stocks, gets only about 6 to 10 visitors each day. This number has been slowly increasing...but is not the main part of my website. I do get some reports from Lycos on the Blog, Stock Picks Bob's Advice, where this particular post is located (!). For instance, in the month of October, I have received 104,697 "requests" which I believe count each "link" on a page as a request, but only 1,555 "page requests". Thus, I figure I get about 50 page views/day on the Blog. This is up from about 938 page views and only 14,672 "requests" in March, 2004. Clearly, I am growing my audience but it isn't like it is a spectacular number of page views like some major websites. I am happy there are people like you who read what I write and are motivated to actually write in and comment. Furthermore, you asked about making money. I think it would be easier and more profitable to work at minimum wage at McDonald's then to make money doing blogs! Now that might be a bit cynical, but I wouldn't get into writing for the profit aspect. Currently, I have two possible profit sources; one, I list some links to Amazon on my main page, and have also linked to the Elliot Wave website. Thus far, I haven't made any money on either! Should you start a website? Or a blog? Why not? If you have something to say, and want to improve your writing and analytic skills, then by all means go ahead and write. You should also visit similar weblogs (like you are apparently doing) and enter into the discussions on those sites and mention you have a blog! It might just work! Also be sure to search out the "blog search engines" and make sure you register your site with those services. What would I like to do? As many of you realize, I have a "day job" outside of the investment world and enjoy this as a hobby. Could this ever grow to something more? It all depends on the work I put into it, and whether the things I write even make sense. When you put it out into cyberspace, well you leave a record and it is a better way, if you like to pick stocks, to demonstrate to yourself and others that you might have some ideas worth considering. I guess that is what it is all about. Thanks so much for taking the time to write. Let me know if you set up a blog, and I would be happy to drop by and let you know what I think! A Reader Writes, "What about AUO, BE, TLB or CGT?" Hello Friends! I am sure delighted that you all could stop by and browse here. I will use this opportunity to encourage each and every one of you who live in the United States to get out and vote. Wait in line. Make sure your vote counts. That is what Democracy is all about. This artwork is from an M.I.T. course for "America in Depression and War." 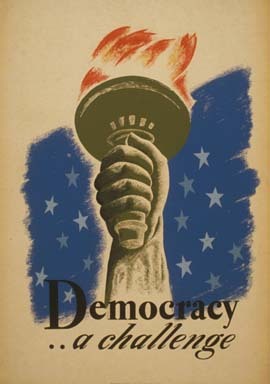 This poster was created sometime between 1936 and 1940 as part of the WPA (Works Project Administration) Project. This time of year, even I have trouble concentrating just on stocks and investing! As I wrote above, I have been away from my computer for about a week now. I did manage to check my own stocks in my trading portfolio to make sure they did not hit stops for sales on profit or loss situations. However, I wasn't doing much about NEW ideas on this blog. I did receive a couple of letters (which I absolutely love receiving....sort of lets me know you guys are really out there....and encourages me to keep writing!) On comment came from Mike who commented on my DP post in the blog. I recently discovered your site and I gotta tell you I used to be a regular reader of Bigtipper.com back during the late nineties tech boom, they later went to a pay model and I'm not even sure if they're still around but ever since I haven't found a good straight-up picks site till now. Keep up the great work. I like the motley fool too but they're too fluffy at times, your stuff cuts right to the chase. I was wondering what your thoughts were on a few dogs in my portfolio, I usually follow your investment philosophy of only selling gainers but tax reasons I wouldn't mind dumping a dog or too this year. Do you think any of these dogs are ripe for a rebound: AUO, BE, TLB or CGT. Maybe you post an entry about it. First of all, thanks so much for your kind words. I try to get "right to the chase"...but then again, I have started veering off a bit....note the current post right HERE with the election poster! You asked about my thoughts about your "dogs", and mentioned my philosophy of "only selling gainers". To answer on my philosophy, I would like to emphasize again that I am an amateur investor, so take everything I write with at least a half grain of salt! However, personally, I believe in selling my LOSERS quickly, so none of my "dogs" grow up! In other words, I sell stocks, even if I have just held them a single day (!) if they hit an 8% loss from my purchase price. So I DON'T believe in holding onto my losers. Next, I DO sell my winners slowly. If you have read some of my other posts, you would know that I like to sell 1/4 of my holdings after the stock up about 30%, 1/4 at about 60%, 1/4 at about 90%, 1/4 at 120% gain. After that, I try to continue selling 1/4 positions at, instead of 30%, 60% intervals. That is 1/4 sold again after 180%, 240%, 300%....etc. etc. etc. I also will sell my ENTIRE position, if a stock hits the 8% loss as I noted above, goes back to break-even if I have sold once at about 30% gain, and after that, selling my entire position if the stock retraces 50% of the largest gain recorded. I hope that all is clear. Thus I don't wait until a stock has BECOME a dog, I sell at the first 'BARK'! First AUO. Looking at the "5-Yr Restated" financials on AUO, we can see a pretty picture of steady revenue growth and the company earned $1.05 in the trailing twelve months. However the free cash flow, while possibly improving (?) is still a negative $(65) million in the trailing twelve months. Not my kind of company. Also, the balancer sheet isn't that clean with $526.6 million in cash and $959.3 million in other current assets, while having $1.1 billion in current liabilities. Prefer to see a bit more assets! Taking a look at recent earnings, we can see that AUO announced 3rd quarter earnings just yesterday! Net profit was up to NT$10.91 billion from NT$4.2 billion last year. However, net profit fell sequentially from NT$12.7 billion recorded in the prior quarter. In addition, they reduced guidance pointing out that they expected wafer shipments to be down 15 to 17% in the fourth quarter. Thus we have a company that is cash flow negative, has a marginal balance sheet, is seeing sequential deterioration in profits, and is guiding LOWER regarding wafer shipments the next quarter. None of those things are encouraging me to suggest that this is anything but a stock to avoid. If you own a stock and wouldn't be buying it now, it goes to show that you should probably be thinking about SELLING. Just imho. Next, how about BE? Bearing Point (BE) has a "5-Yr Restated Morningstar" that shows an ERRATIC picture of revenue growth. Earnings are non-existent and apparently losses are actually increasing since 2002. Free cash flow has been deteriorating, and the balance sheet is a bit marginal imho with $122.7 million in cash and $739.6 million in other current assets, barely covering the $629.4 million in current liabilities. This one doesn't do too much for me! Third, what about TLB? Looking at the Talbots "5-Yr Restated" financials, we can see that revenue has plateaued at about $1.6 billion in 2001, and is still only $1.67 billion in the trailing twelve months. Earnings have gone nowhere, the dividend has grown fortunately, and the company is spinning off some free cash with an outstanding balance sheet on Morningstar. Finally, on retail concepts, including restaurants, I am most concerned about the information on "same store sales". This lets you know whether existing stores are experiencing real growth or if perhaps the concept is in trouble. On October 7, 2004, three weeks ago, TLB TLB reported "same store sales" for September. Same store sales actually fell 1.3% which was "good news" because the 'street' was actually expecting WORSE results of a drop of 4% in same store sales. Thus, even though total monthly sales were up 3%, the more important number, of how much existing stores were growing or shrinking was a resounding SHRINKING of 1.3%. Not exactly my cup of tea. You will have to decide whether you want to keep owning this stock! The last stock you mentioned was CGT. CGT doesn't even have any information on Morningstar for "5-Yr financials"....so I wouldn't go any further in my rather strict approach (!) to investing. Looking to Yahoo for some news, I came across the CAE first quarter results. In this case, this Canadian company reported increased revenue and earnings. However, since I don't have so much data I would like to review before commenting, I am left literally in the dark on this stock and would find a company with more information I could evaluate before making a comment one way or another! PHEW....that was a long post, and I was JUST answering some comments. Thanks so much for bearing with me. If you have any comments, questions, or words of encouragement, please feel free to email me at bobsadviceforstocks@lycos.com . And please remember to VOTE!